A National Scenic Byway is a road recognized by the United States Department of Transportation for one or more of six "intrinsic qualities": archeological, cultural, historic, natural, recreational, and scenic. The program was established by Congress in 1991 to preserve and protect the nation's scenic but often less-traveled roads and promote tourism and economic development. The National Scenic Byways Program (NSBP) is administered by the Federal Highway Administration (FHWA). The most-scenic byways are designated All-American Roads, which must meet two out of the six intrinsic qualities. The designation means they have features that do not exist elsewhere in the United States and are unique and important enough to be tourist destinations unto themselves. As of November 2010, there are 120 National Scenic Byways and 31 All-American Roads, located in 46 states (all except Hawaii, Nebraska, Rhode Island, and Texas). The NSBP was established under the Intermodal Surface Transportation Efficiency Act of 1991, which provided $74.3 million in discretionary grants. On May 18, 1995, FHWA specified the intrinsic qualities that would serve as criteria for designating road as National Scenic Byways or All-American Roads. In September U.S. Transportation Secretary Federico Peña announced the first 14 National Scenic Byways and six All-American Roads. On June 9, 1998, the Transportation Equity Act for the 21st Century (TEA-21) provided $148 million to states so they could develop state roads to take advantage of the program. On August 10, 2005, President George W. Bush signed the Safe, Accountable, Flexible, Efficient Transportation Equity Act: A Legacy for Users (SAFETEA-LU), which provided $175 million to states and Indian tribes. Most recently, on October 16, 2009, U.S. Transportation Secretary Ray LaHood designated 37 new roads as National Scenic Byways and five new All-American Roads. National Scenic Byways go through a nomination procedure. They must already be designated state scenic byways to be nominated (However, roads that meet all criteria for national designation but not state designation may be considered for national designation on a case-by-case basis). For designation as a National Scenic Byway a road must have one of six intrinsic qualities. To be designated an All-American Road, a road must have at least two of the six qualities. Scenic quality is the heightened visual experience derived from the view of natural and manmade elements of the visual environment of the scenic byway corridor. The characteristics of the landscape are strikingly distinct and offer a pleasing and most memorable visual experience. Historic quality encompasses legacies of the past that are distinctly associated with physical elements of the landscape, whether natural or manmade, that are of such historic significance that they educate the viewer and stir an appreciation for the past. The historic elements reflect the actions of people and may include buildings, settlement patterns, and other examples of human activity. Cultural quality is evidence and expressions of the customs or traditions of a distinct group of people. Cultural features include, but are not limited to, crafts, music, dance, rituals, festivals, speech, food, special events, or vernacular architecture. Archeological quality involves those characteristics of the scenic byways corridor that are physical evidence of historic or prehistoric human life or activity. The scenic byway corridor's archeological interest, as identified through ruins, artifacts, structural remains, and other physical evidence have scientific significance that educate the viewer and stir an appreciation for the past. Recreational quality involves outdoor recreational activities directly associated with and dependent upon the natural and cultural elements of the corridor's landscape. The recreational activities provide opportunities for active and passive recreational experiences. They include, but are not limited to, downhill skiing, rafting, boating, fishing, and hiking. Driving the road itself may qualify as a pleasurable recreational experience. The recreational activities may be seasonal, but the quality and importance of the recreational activities as seasonal operations must be well recognized. A general review of the road's or highway's safety and accident record to identify any correctable faults in highway design, maintenance, or operations. A narrative on how the All-American Road would be promoted, interpreted, and marketed in order to attract travelers, especially those from other countries. A plan to encourage the accommodation of increased tourism, if this is projected. Some demonstration that the roadway, lodging and dining facilities, roadside rest areas, and other tourist necessities will be adequate for the number of visitors induced by the byway's designation as an All-American Road. A plan for addressing multi-lingual information needs. The final step is when the highway (or highways) is approved for designation by the United States Secretary of Transportation. June 13, 2002 (AAR, all states) Historic gateway to the Midwestern U.S.
54 87 Alabama September 19, 1996 (AAR) Route of the 1965 Selma to Montgomery March led by Martin Luther King, Jr.
^ Federal Highway Administration. "About the National Scenic Byways Program". America's Byways. Federal Highway Administration. Retrieved April 9, 2012. ^ Federal Highway Administration. "List of America's Byways". America's Byways. Federal Highway Administration. Retrieved November 7, 2010. ^ National Scenic Byways Program. "History of the Program". Program Information. Federal Highway Administration. Retrieved August 3, 2012. ^ a b c d e Slater, Rodney E. (May 18, 1995). "National Scenic Byways Program Interim Policy". Federal Register. Washington, DC: Government Printing Office. 60 (96): 26759–62. Retrieved May 12, 2009. ^ "A1A Scenic & Historic Coastal Byway". America's Byways. Federal Highway Administration. ^ "Acadia All-American Road". America's Byways. Federal Highway Administration. ^ "Alabama's Coastal Connection". America's Byways. Federal Highway Administration. ^ "Alaska Marine Highway". America's Byways. Federal Highway Administration. ^ "Amish Country Byway". America's Byways. Federal Highway Administration. ^ "Arroyo Seco Historic Parkway - Route 110". America's Byways. Federal Highway Administration. ^ "Ashley River Road". America's Byways. Federal Highway Administration. ^ "Baltimore's Historic Charles Street". America's Byways. Federal Highway Administration. ^ "Beartooth Highway". America's Byways. Federal Highway Administration. ^ "Big Bend Scenic Byway". America's Byways. Federal Highway Administration. ^ "Billy the Kid Trail". America's Byways. Federal Highway Administration. ^ "Blue Ridge Parkway". America's Byways. Federal Highway Administration. ^ "Brandywine Valley Scenic Byway". America's Byways. Federal Highway Administration. ^ "Cascade Lakes Scenic Byway". America's Byways. Federal Highway Administration. ^ "Cherohala Skyway". America's Byways. Federal Highway Administration. ^ "Cherokee Foothills Scenic Highway". America's Byways. Federal Highway Administration. ^ "Cherokee Hills Byway". America's Byways. Federal Highway Administration. ^ "Chesapeake Country Scenic Byway". America's Byways. Federal Highway Administration. ^ "Colorado River Headwaters Byway". America's Byways. Federal Highway Administration. ^ "Connecticut State Route 169". America's Byways. Federal Highway Administration. ^ "Copper Country Trail". America's Byways. Federal Highway Administration. ^ "East Tennessee Crossing". America's Byways. Federal Highway Administration. ^ "Edge of the Wilderness". America's Byways. Federal Highway Administration. ^ "Florida Keys Scenic Highway". America's Byways. Federal Highway Administration. ^ "Great Lakes Seaway Trail". America's Byways. Federal Highway Administration. ^ "Great River Road". America's Byways. Federal Highway Administration. ^ "Historic Columbia River Highway". America's Byways. Federal Highway Administration. ^ "Indian River Lagoon National Scenic Byway". America's Byways. Federal Highway Administration. ^ Indian River Lagoon National Scenic Byway: A Guide to Indian River, Brevard, and Volusia Counties (PDF). Indian River Lagoon National Scenic Byway Coalition, Inc. November 2015. Retrieved 20 July 2017. ^ "Journey Through Hallowed Ground Byway". America's Byways. Federal Highway Administration. ^ "Kaibab Plateau–North Rim Parkway". America's Byways. Federal Highway Administration. ^ "Lakes to Locks Passage". America's Byways. Federal Highway Administration. ^ "Lariat Loop Scenic and Historic Byway". America's Byways. Federal Highway Administration. ^ "Las Vegas Strip". America's Byways. Federal Highway Administration. ^ "Merritt Parkway". America's Byways. Federal Highway Administration. ^ "Mt. Hood Scenic Byway". America's Byways. Federal Highway Administration. ^ "North Shore Scenic Drive". America's Byways. Federal Highway Administration. ^ "Northwest Passage Scenic Byway". America's Byways. Federal Highway Administration. ^ "Red Rock Scenic Byway". America's Byways. Federal Highway Administration. ^ "River Road Scenic Byway". America's Byways. Federal Highway Administration. ^ "Sheyenne River Valley Scenic Byway". America's Byways. Federal Highway Administration. ^ "Staunton-Parkersburg Turnpike". America's Byways. Federal Highway Administration. ^ "Strait of Juan de Fuca Highway - SR 112". America's Byways. Federal Highway Administration. ^ "Talladega Scenic Drive". America's Byways. Federal Highway Administration. ^ "Top of the Rockies". America's Byways. Federal Highway Administration. ^ "Scenic Byway 12". America's Byways. Federal Highway Administration. ^ "Washington Heritage Trail". America's Byways. Federal Highway Administration. ^ "Woodward Avenue (M-1) - Automotive Heritage Trail". America's Byways. Federal Highway Administration. Irving, Lori (June 15, 2000). "U.S. Transportation Deputy Secretary Downey Announces New All-American Roads, National Scenic Byways in 20 States" (Press release). Federal Highway Administration. —— (June 13, 2002). "U.S. Transportation Secretary Mineta Names 36 New National Scenic Byways, All-American Roads" (Press release). Federal Highway Administration. Federal Highway Administration (September 22, 2005). "Share the Celebration!—45 New Designations Announced" (Press release). Federal Highway Administration. "State Tops in Scenic Roads". Denver Post. September 20, 1996. p. B1. Whitney, Karen (June 9, 1998). "Transportation Secretary Slater Announces All-American Roads, Scenic Byways in 19 States" (Press release). Federal Highway Administration. Archived from the original on July 11, 2009. 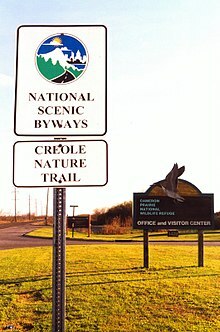 Wikimedia Commons has media related to National Scenic Byways.